You can download our Final Year 5 project report (as a PDF File) by clicking on the graphic at right. Please note that this document is 6.9MB in size so it may take a few moments to download. 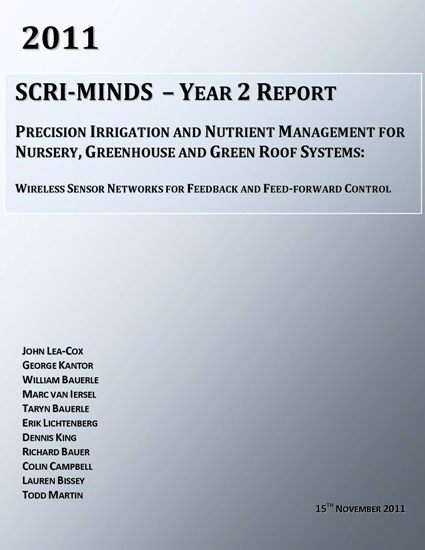 The SCRI-MINDS project has demonstrated multiple benefits of wireless sensor control systems for commercial nursery and greenhouse operations. This starts with reducing water applications in comparison to our best irrigation managers by between 40 and 70%, depending on crop and season. However, these reductions in irrigation water use also extend to significant reductions in nutrient leaching and crop loss due to disease, with associated environmental benefits. As importantly, we have demonstrated that there are multiple benefits which are associated with increased timeliness of irrigation decisions, which all translate into increased crop yield and quality and ultimately increased profitability for growers. All of these benefits are highlighted in our Final Year 5 report, and documented in our list of publications and presentations. The success of this project will culminate in the commercial release of the PlantPointTM advanced sensor network control system by Decagon Devices, Inc. in early 2015. You can download our complete Year 4 project report (as a PDF File) by clicking on the graphic at right. Please note that this document is 4.6MB in size so it may take a few moments to download. Year four was a critical implementation and testing year for the SCRI-MINDS project. 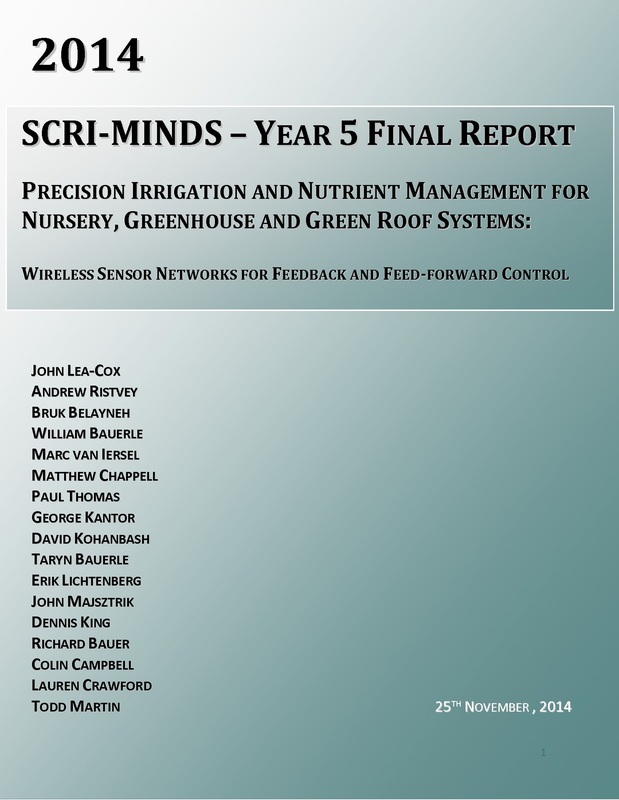 The engineering effort that we put into the development of the advanced monitoring and control (nR5) node and supporting software (Sensorweb) in Years 2 and 3, was implemented in all of our research sites and commercial operations during 2013. Further development and testing of the hardware and software is continuing, on a path to commercializing the system at the end of year 5. We are now actively monitoring and controlling irrigation in 15 different locations, including nine commercial greenhouses and nurseries. Many of the exciting results reported by the scientific and economic teams this year are based on this implementation. Our latest Impact Statements can be found on the American Society for Horticultural Science CHRIS website. You can download our complete Year 3 project report (as a PDF File) by clicking on the graphic at right. Please note that this document is 5.8MB in size so it may take a few moments to download. Year three was pivotal for the SCRI-MINDS project. 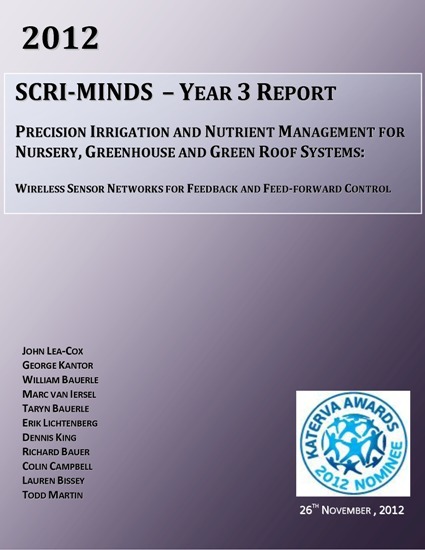 The significant engineering effort put into the development of the advanced monitoring and control (nR5) node and supporting software (Sensorweb) in Year 2, was implemented in a number of research situations and commercial operations during 2012. We are now actively monitoring and controlling irrigation in 12 different locations, including 6 commercial greenhouses and nurseries. Many of the exciting results reported by the scientific teams this year are based on this implementation. The relatively flawless deployment of this advanced irrigation monitoring and control system has allowed us to achieve significant reductions in water use that are impossible to achieve without this technology. We have also seen that in some cases the cropping cycle can be drastically shortened, while crop / flower quality is improved. This can have a major economic impact on greenhouses and nurseries. This is possible because the system combines precision irrigation strategies with decision-support provided by a range of moisture sensors and models for various species. You can download our Year 2 project report (as a PDF File) by clicking on the graphic at right. Please note that this document is 2.5MB in size. The SCRI-MINDS group continued to make significant progress during year 2, and all aspects of the project are on track or ahead of schedule. Our Impact Statements can be found on the American Society for Horticultural Science CHRIS website here. You can download our Year 1 project report (as a PDF File) by clicking on the graphic at right. Please note that this document is 2.6MB in size. 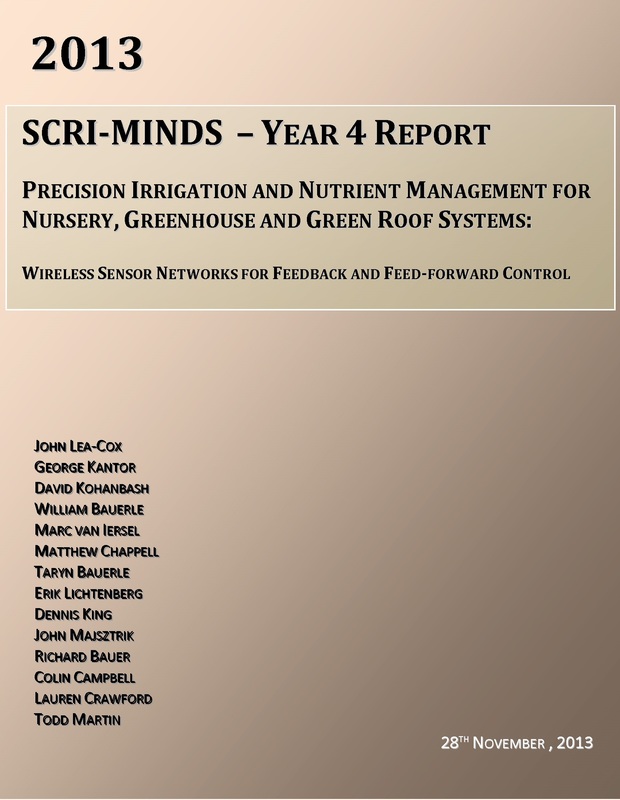 The SCRI-MINDS group made significant progress during the first year, and almost all aspects of the project are on track or ahead of schedule. Our project is funded from 2009 through 2014.